Summary: The US Army and Marines are breaking. It’s a slow inexorable process resulting from fighting 4GWs around the world too long with too few men. Neocon war-mongers, national leaders, and the general public remain blind to the evidence, so they can express surprise when the results eventually become too severe to ignore. It took a decade to repair the damage after Vietnam, under more favorable social and economic circumstance than likely in early 21st century America. Here we see another warning from a senior officer, and revisit data from the latest Army report about this slow-growth crisis, another in a string of similar reports. See the links at the end to other articles on this topic. Update: The “we” in the title refers (as always on this website) to the American people. As the shown in previous posts and the report described here, the military quickly recognized these problems and strongly responded with measures to mitigate the damage. Unfortunately, solutions lie beyond the state of the medical and social sciences. Perhaps these ills result inexorably result from war. Scales says too few troops have been carrying too heavy a burden for too long. “I don’t care if you’ve got an army of Robert E. Lees, the anecdotal evidence clearly shows the ground forces are going through an unprecedented realm of emotional stress,” he says. … When you overtax an institution as is happening now with the Army, cracks and fissures will result, Scales says. “They may be exacerbated or aggravated or accelerated by isolated instances of poor leadership, but then you have to ask yourself why all of a sudden the leadership became poor. The leadership begins to fracture when the leaders themselves are exhausted. I’m talking to generals today who look me in the eye and say, ‘Bob, I’m suffering from PTSD,’ ” he says. Armies break anecdotally before they break statistically, Scales says. He worries the Army is heading for another breaking point: “The classic case, of course, is 1971, when everybody in my generation woke up and found the Army broken.” Scales commanded two units in Vietnam, where he earned a Silver Star for actions around the Battle of Hamburger Hill during the summer of 1969. By 1971, there was a dramatic increase in fragging, suicides, drug and alcohol abuse, domestic violence and criminal behavior of all kinds he says. “It took a generation to rebuild the Army. I’m not a psychiatrist or a psychologist, but I lived through” the process of rebuilding a broken Army, he says. There is no historical precedent for the current situation – nearly 10 years of war with an all-volunteer force, and no end in sight. When one considers the number of deployments and the time in combat many soldiers have experienced, the Army has held together far better and far longer than could be expected, Scales says. “Have we reached the breaking point? I don’t know. We’re in new territory,” he says. For information about DoD’s efforts to fight this problem see “DoD Task Force On The Prevention Of Suicide By Members Of The Armed Forces“, August 2010. I am reminded of what I heard from two active duty officers (colonels) last year. They said that they had been required to talk to therapists as part of their return from combat processing. The “shrinks” asked if there was anything that they had seen in the wars that bothered them. So, they told them and the listeners were so obviously frightened and disturbed that they didn’t do it again. Like any good analysis, this report describes complex and poorly understood psychological phenomena with humility. We do not well understand the causes of these trends nor how to mitigate them. After years of research, of which this is just the latest, all we clearly see are the cracks growing in our Armed Forces. If allowed to continue, they will slowly degrade. Should some real threat arise, unlike the almost meaningless wars which we now fight, we might find their blades worn — or that they shatter when most needed. History offers countless examples, as warnings. Excerpts from “Health Promotion, Risk Reduction and Suicide Prevention Report“, US Army, July 2010. Previously examined in depth here. Red emphasis added. 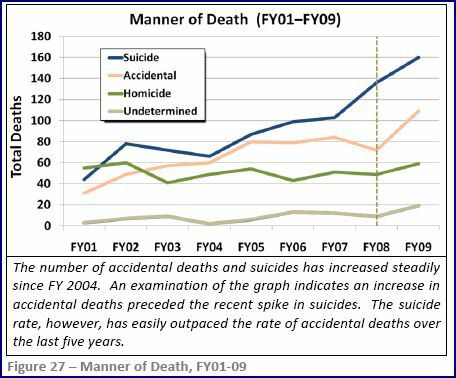 Although this report is scoped through FY 2009, FY 2010 data indicate suicides continue to increase. While active duty suicides are at a comparable rate to the FY 2009 total (i.e., 120 through 3rd QTR versus 160 in FY 2009), the rate of suicides among non-mobilized RC Soldiers has increased. Statistics reflect a shift in demographics with 84 non-mobilized RC Soldier suicides thru 30 June. So while the overall total to date is approximately the same as last year, non-mobilized RC Soldier suicides have already surpassed FY 2008 and 2009 numbers (61 and 79 respectively). Of the 120 active duty suicides thru 30 June 2010, 59% (71) involved Soldiers within their first five years of service. Of these 71, 96% (68) involved Soldiers who never deployed or deployed just once. 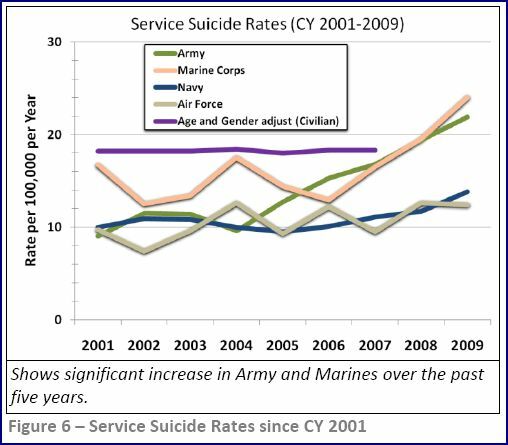 Additionally, active duty suicide attempt data are consistent with the FY 2009 total. During the first two quarters of FY 2010, 787 active duty Soldiers, or 46% of the FY 2009 total, attempted suicide. This section amplifies the trip’s initial findings. Illicit drug use surveillance and detection systems are inadequate (e.g., over 1,318 Soldiers who had failed multiple drug tests (two or more) are still serving). Prescription drug use is on the rise with over one third of the force on prescription medication; for example, 14% of the force is taking some form of opiate medication. Gaps in current process and systems are masking potential illicit drug use. To make matters worse, not all Soldiers are being tested for drug use. Of those who test positive, not all are being referred for evaluation or treatment. As outlined in this section, the potential climate for abuse is obvious. Also, crime is on the rise and discipline is seemingly going unchecked. In fact, approximately 1,054 Soldiers who have committed two or more felony offenses are still serving in the Army today. 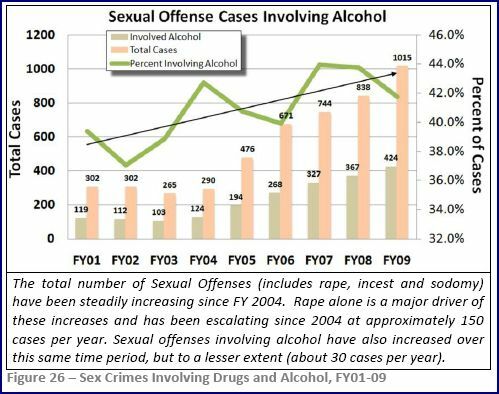 One of the more disturbing trends from FY 2001 – FY 2009 is a clear and steady rise in the number of sexual offenses, which have essentially tripled since FY 2003. 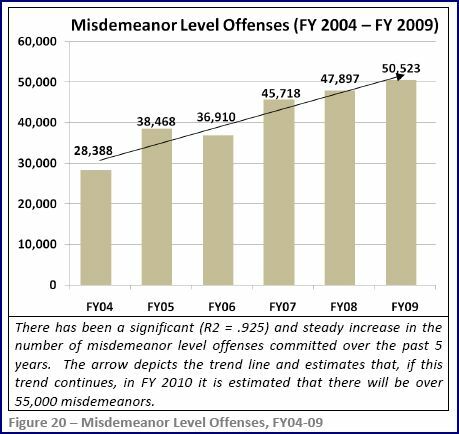 This represents a specific increase from 265 cases in FY 2003 to a substantial 1,015 in FY 2009. In addition, there were 293 restricted reports in FY 2009 that are not reflected in these data. While these increases may be attributed to overall Army efforts to increase awareness, reporting and intervention, the steady rise is still cause for concern. It suggests that despite the Army’s awareness campaign, there is still an indication that this high risk behavior will continue in the force. Because accidental deaths can be considered the result of high risk behavior, these numbers speak to the fact that risk-seeking behavior is slowly increasing among Soldiers. When compared to FY 2001, the death rates of both suicide and accidental death have more than tripled. For a comprehensive list of links see An Army near the Breaking Point – studies & reports. Next Post Pain and misery builds discipline!